Professor Christine Houston is a celebrated and award-winning playwriter who is also a committed and highly respected educator at Chicago State University. Home to many minorities in the Windy City, this college currently has a 75 percent African-American student population. Although it is not a “historically black college or university,” much of the student body agrees that it feels like one. Many famous and successful former students, such as Kanye West and Godfrey the Comedian, have graduated from this university. Known for stellar productions, CSU Theatre is a major component of the Communications, Media Arts and Theatre program at the school. The department is working on a new set of plays while preparing to host a play festival this year. Passionate teachers like Houston are distinguished by their commitment to the achievement of their students. Commitment is an essential element of successful teaching. As a professor, she works diligently to cultivate each student’s curiosity and interest in learning. Houston keeps the students engaged by constantly finding new ways to motivate them. Without question, she understands the crucial role she plays in their development. Houston wants her students to learn and grow, and it is her belief that learning requires a willingness to take risks. As a result, relationships with her students form the bedrock of her pedagogy as she seeks to create safe places for her students that are grounded in the trust that can only develop through authentic care and concern for students as individuals. Hence, the guiding principle of her approach to teaching is something that is true of every great teacher – a focus on developing relationships with her students. In her classroom, relationships are at the center of everything. 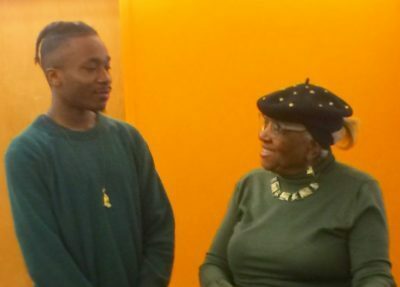 Professor Houston, who lectures in screenwriting at Chicago State University, has been teaching her students how to write proper scripts and pitch them to directors and studios in Hollywood. She teaches screenwriting, playwriting, and theater at Chicago State University. Houston is very direct, encouraging, hands-on, as well as confidence-boosting. This professor is a successful actress, play-write, and award winner. She wrote a play about her childhood that chronicled Houston’s years growing up in the neighborhood now known as Bronzeville. The play went on to win multiple contests, such as the Lorraine Hansberry, ANTA West, and Norman Lear as well as becoming a hit television series on NBC. Houston has received an NAACP Image Award for playwriting. She also worked as a staff writer on the “Punky Brewster” television series. In 1985, Houston’s hit play titled, “Two Twenty-Seven” went on to become NBC’S hit television series “227.” This celebrated educator has written a novel called “Laughing Through the Tears” and co-wrote the textbook, “The Screenwriter’s Guidebook: Learning from African American Film and Television Writers” along with Christine List. Teaching is one of the most complicated jobs today, yet Houston does it without complaint. The level of excellence she demonstrates is founded on a broad knowledge of the subject matter, high standards, enthusiasm, a caring attitude, a love of learning and, above all else, a desire to make a difference in the lives of young people. With all these qualities required, it is no wonder that great teachers, like Houston, are hard to find. Her passion for theater is second to none. Right before this interview, she was in full teaching mode with students practicing their script writing pitches in preparation for their final exam. 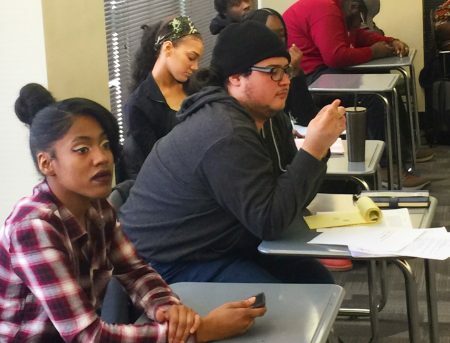 They all looked to pass and perform in the upcoming play festival that will be held at Chicago State University. Good teachers join self, subject, and students in the fabric of life because they teach from an integral and undivided self; they manifest in their own lives, and evoke in their students, a capacity for connectedness. They are able to weave a complex web of connections between themselves, their subjects, and their students so that students can learn to weave a world for themselves. This adequately describes CSU’s beloved playwright known as Professor Christine Houston.